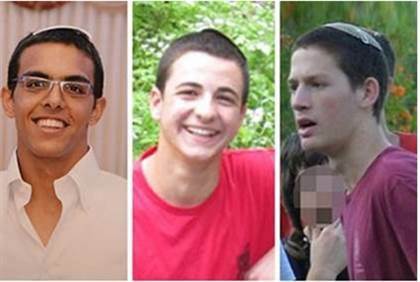 June 12, 2014 - In a tragic end to an intensive search by the IDF, intelligence services and police, it has been released for publication this evening (Monday) that IDF forces have discovered the bodies of the three teenagers abducted 18 days ago as they hitchhiked home near the town of Alon Shvut in the Gush Etzion region. Eyal Yifrah 19, from Elad; Gilad Sha'ar, 16, from Talmon; and Naftali Frenkel, also 16, from Nof Ayalon, went missing on June 12th, and officials soon identified Hamas as the culprits. Their bodies were found near Hevron, where the search operation for them - dubbed Operation Brother's Keeper - had been focused. Last week the IDF authorized for publication the identities of two Hamas terrorists being hunted for being "deeply involved" in the kidnappings of the boys. The two, Marwan Kawasmeh and Amar Abu-Eisha, are well-known Hamas terrorists operating in the Hevron area. Kawasmeh, 29, was first arrested in 2004 for security violations, and since then has been arrested at least four more times. In an interrogation in 2010, he admitted working on behalf of Hamas in the Hevron area. He has participated in Hamas training camps and has helped the terror group to recruit new members. Abu-Eisha, 33, was first arrested in 2005, and remained imprisoned until 2006. He was released, only to be arrested again in 2007. His brother was killed while conducting a terror attack in 2005 against an IDF patrol. His father has also been arrested numerous times for security offenses. A total of 413 terror suspects, mostly Hamas members, have been arrested during IDF operation; Kawasmeh and Abu-Eisha, however, have not yet been found, but are now presumably being hunted on suspicion of murder. During the past 18 days Israelis and Jews throughout the world had mobilized, holding prayer rallies, social media campaigns and solidarity marches calling for the return of the boys. As recently as yesterday officials were still saying they working working under the assumption that the boys were still alive, as no information had been received to the contrary. News of their murder will leave Israel, and the Jewish people, in a state of mourning. The news comes on the same day as an inquiry into the handling of the police investigation into the kidnappings found five senior police officials guilty of mishandling the investigation. The officials were dismissed from their post for mistakenly classifying a call by one of the teenagers - who said he was being kidnapped - as a prank.